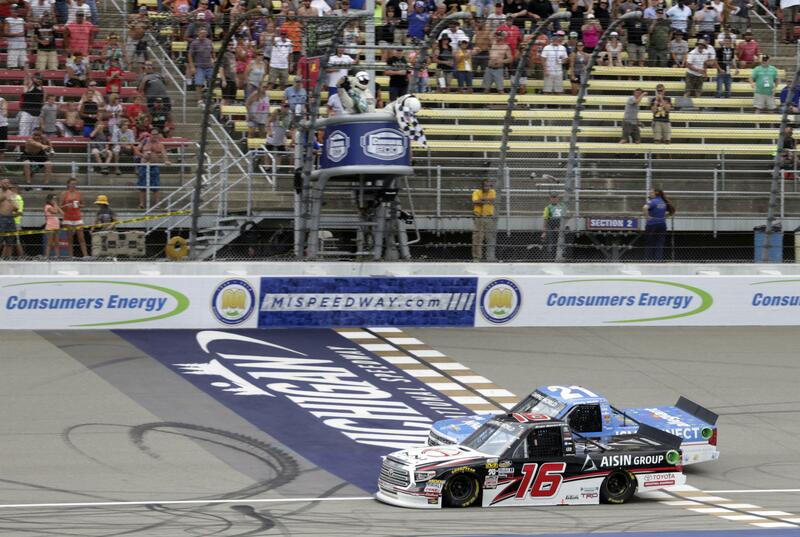 UPDATED: Sat., Aug. 11, 2018, 9:04 p.m.
BROOKLYN, Mich. – Brett Moffitt passed Jimmy Sauter just before the finish line Saturday at Michigan International Speedway for his fourth NASCAR Truck Series victory of the season. Moffitt edged Sauter – the leader the previous 12 laps – by 0.025 seconds. “Pretty amazing this little team’s gone to Victory Lane four times this year,” Moffitt said. “The whole last however- many laps I was behind (Sauter), I would get to him, but I would push him with that air bubble between our bumpers. Noah Gragson was fourth, and Todd Gilliland fifth after leading a race-high 18 laps. Moffitt tied Sauter for the series victory lead. Sauter leads the season standings with 625 points, 56 points ahead of second-place Gragson going into Thursday’s race at Bristol, Tennessee, the final event before the playoffs. Eight drivers qualify for the postseason. Published: Aug. 11, 2018, 1:49 p.m. Updated: Aug. 11, 2018, 9:04 p.m.